Master the art and technique of grilling! Grilled meats, and the sauces, marinades, and rubs that give them identity and flavor—that’s the primal pleasure grillmaster Lex Taylor serves up as he explores the art of cooking with fire. 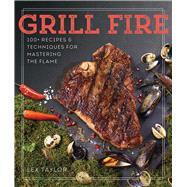 Grill Fire offers more than just a collection of recipes: Taylor teaches essential grilling skills and tricks for transforming your backyard grill into a Brazilian churrascaria, making your own chicken wing racks, and feeding the hungry hordes. Along with tasty variations on the burger and dog, his delicious, globally influenced dishes range from Japanese kobe slices served with umami tare sauces to Mexican rotisserie chicken, crème brûléed pork chops, Cameroonian Snapper, and the perfect porterhouse. So light up the fire . . . and start cooking! Lex Taylor is a grill master who has catered BBQ events and run pop-up restaurants for a variety of retailers, bars, and eateries in New York City for 15 years, serving up classic American BBQ and epic grilled meats inspired by techniques he learned while traveling in the Americas, the Caribbean, Africa, Asia, and the Middle East—and from cooking just about everywhere, from Mexican fishing villages to the floe edge of Inuit hunting camps. Lex's interests also include curing, pickling, sausage making, knife making, and camping. Lex recently won Esquire TV's The Next Great Burger contest with his New Orleans-inspired deep-fried beignet burger. Lex lives in Ossining, NY.